Shahrom (centre) and Shahril (second left) of Team SASA receive their prize from Ik Pahon (third left), as Miro (third right) and others look on. Nur Assyria and Mohd Syahkirin of Toakas Racing Team reach the finish line, ahead of their competitors in the Mixed category. 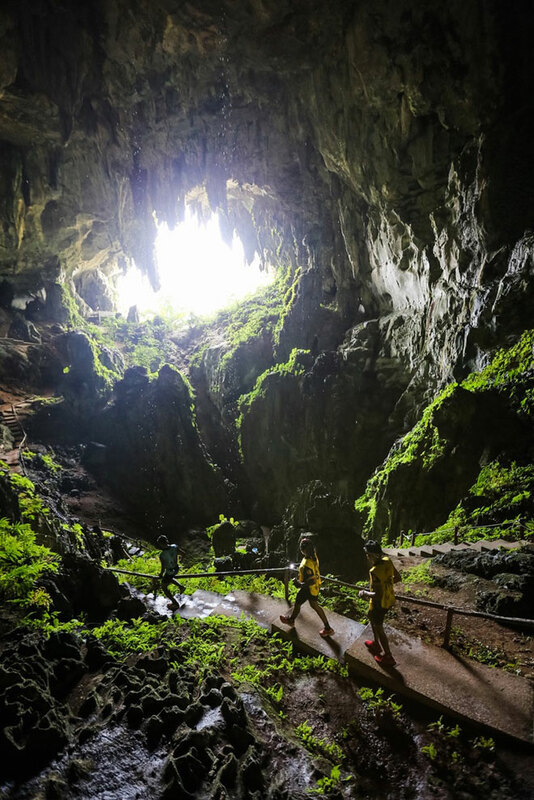 KUCHING: A total of 52 teams went head-on with the terrain of the Bau region in what competitors called the ‘most gruelling race’, the inaugural ‘Sarawak Adventure Challenge–The Lost Mines’ which was flagged off at the Fairy Cave on Saturday. Organised by Draco Action Sports Sdn Bhd, the event attracted competitors from Sarawak, as well as those from Peninsular Malaysia, Brunei, Singapore, Indonesia, the Philippines, South Africa and New Zealand. 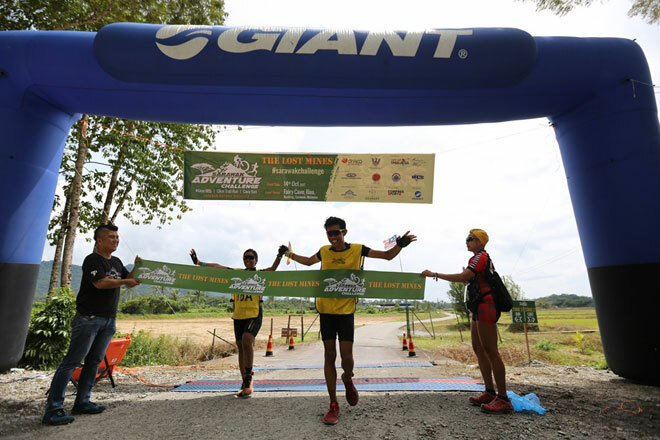 After flag-off, the participants had to endure a rugged course comprising a 46km mountain biking route, a cave section and the final 13km trail run. The top three teams in the Men’s category and the top two in the Mixed category were from Peninsular Malaysia. The Men’s champion was Team Sasa comprising Shahrom Abdullah and Shahril Amir, who finished the course in an astounding four hours and 20 minutes. They bagged the grand prize of RM6,000. The first runner-up duo was Sukan Lasak ATM B Melaka consisting of Mohd Suhar Ismail and Mohd Nazir Ahmad, who received RM3,500. Armed Forces Team A (Saiful Khohar Abdul Halim and Mohd Azuan Asmuni) placed third, pocketing RM2,000. Two Sarawak teams – Spring Sprong (Wan Hairal Wan Zainal and Osman Abdul Malik) and Giant 1 (Jacobus Gerstner and Laurel Adrian) – finished in fourth and fifth, respectively. In the Mixed category, the winning team was Toakas Racing Team comprising Nur Assyria Zainal Abidin and Mohd Syahkirin Ibrahim, who took home the RM6,000 grand prize. Respective runners-up were Kamikaze Adventure Team (Azlinawati Husain and Mohd Irwan Yusuf Abdulla) and Eco Adventure Team from Sarawak (Chai Shiaw Fung and Hardy Suntol), who received RM3,500 and RM2,000, respectively. Another Sarawak team, Giant 2 (Lin Wei Na and Tan Wee Ming) came in very close at fourth to claim the RM1,000 prize money. 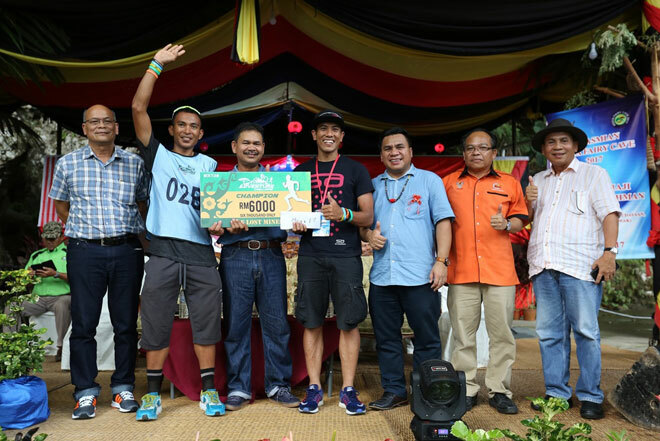 Prizes were presented by Ministry of Tourism, Arts, Culture, Youth and Sports permanent secretary Datu Ik Pahon Joyik and Serembu assemblyman Miro Simuh during the ‘Fairy Cave Festival’, held in conjunction with Sarawak Adventure Challenge 2017’. The event was supported by the state government through its Ministry of Tourism, Arts, Culture, Youth and Sports; Sarawak Tourism Board, the state constituencies of Tasik Biru (N2) and Serembu (N18) as well as Bau District Council. Other event sponsors and partners included MCC Overseas Malaysia, Compressport Malaysia, The Marian Boutique Lodging House, The Granary Kitchen + Bar, and Giant Bicycles. Meanwhile, organiser Draco Action Sports promised that next year’s event would continue to provide competitors an exciting challenge, which would highlight Sarawak’s spectacular landscape and attractions. This year’s Sarawak Adventure Challenge was a part of What About Kuching (WAK) 2017 – the month-long festival that celebrates the arts, culture and lifestyles of the people of Kuching. Copyright © 2019 Sarawak Adventure Challenge. All Rights Reserved. Website by Neudimenxion.